SUMMARY: After narrowly escaping The Darkling at the end of Shadow & Bone, Mal and Alina continue to elude capture. But The Darkling soon finds them and forces them on a new mission: to find a second amplifier and further develop Alina's powers as a Sun Summoner. REVIEW: Another highly-anticipated sequel that I struggled to finish. Reading Siege & Storm was a MARATHON. While it started with a bang, the story slowed after about page 50 and really didn't pick up until about 50 pages from the end. It took me nearly two weeks to finish the book, and I hated that I had to force myself to read most of the middle. It's not that it wasn't interesting or that the middle wasn't important; I just couldn't make myself want to read it. Stuff definitely happens, and I loved the introduction of Sturmhond, but it just wasn't anywhere near as compelling as Shadow & Bone. If it's been awhile since you read Shadow & Bone, you might want a refresher. Very little is rehashed from the previous book. If you haven't read S & B, you will be completely lost--go read that one first. Characters and world-building are once again top-drawer, and I would not have expected anything less from the talented Leigh Bardugo. I still REALLY love The Darkling, but my opinion of Mal (who I loved in the first book) is starting to waver a bit. I'm sure it's not easy being the "normal" boyfriend of a world-renowned saint, but I found Mal to be exceptionally whiny in this book. He's insecure and demanding and could be a total jackass at times. He's holding Alina back, and that's just so disappointing. The Darkling is still as cool as ever, but he's not in this book nearly enough. A new possible love interest is also introduced. Sturmhond (a.k.a. Nikolai) could be interesting in the third book. Not really sure where that relationship is headed, but I can't wait to find out. Alina kind of got under my skin in this one too. For much of the book, she seems so power-hungry. I know, I know, she wants to use her powers to save the world and all that. Yeah, I get it. But she's awfully determined to find the Firebird...doesn't she see that she's just as determined to sharpen her powers as the Darkling is to sharpen his? 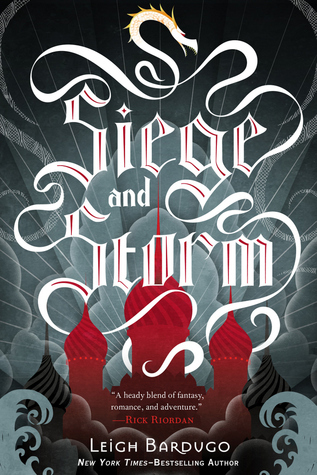 THE BOTTOM LINE: Fans of Shadow & Bone will want to read Siege & Storm (and they certainly should), but don't expect a fast pace. When you have a cast of characters this complex, answers do not come easy. Nothing is black-and-white, and no one is totally good or totally evil. Once again, some of the best writing and world-building I've seen; just be sure to pack your patience. STATUS IN MY LIBRARY: On order. Shadow & Bone is mildly popular in my library, and the sequel will also be popular. Alexa, I don't know why I had so much trouble with the pacing. You are absolutely right that a lot happened, but I really didn't love it like I loved S&B. Most of the reviews have been really positive though, so it appears I'm in the minority once again! The pacing was slow. That ending....WOW. I am so excited for the next one. Another great book from Bardugo. I wanted to cry when I finished it! Anxious to see how it will end. I love fantasy stories, amazing attention to details as on the previous book.